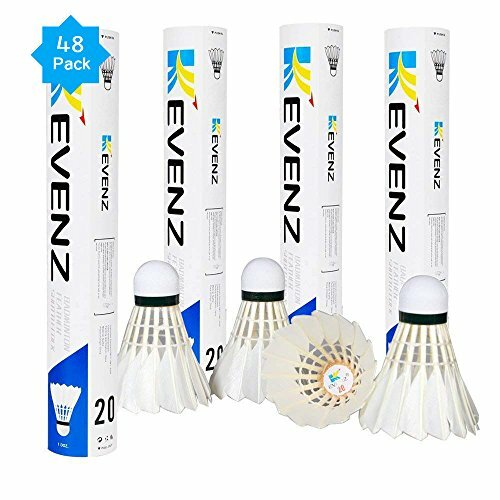 KEVENZ 48-Pack Advanced Goose Feather Badminton Shuttlecocks,Nylon Feather Shuttlecocks High Speed Badminton Birdies Balls with Great Stability and Durability (White,48-Pack) by KEVENZ at Deep Tennis. MPN: Z-US-BADMINTON-WHITE-48. Hurry! Limited time offer. Offer valid only while supplies last. If you have any questions about this product by KEVENZ, contact us by completing and submitting the form below. If you are looking for a specif part number, please include it with your message.